Watch our video or read below to find out how to locate your crash report. Navigate to your Roaming folder. This can be done by typing “%appdata%” in the Windows search bar. Navigate to the “crash-reports” folder. If this folder does not exist go to “Locating a Log File”. 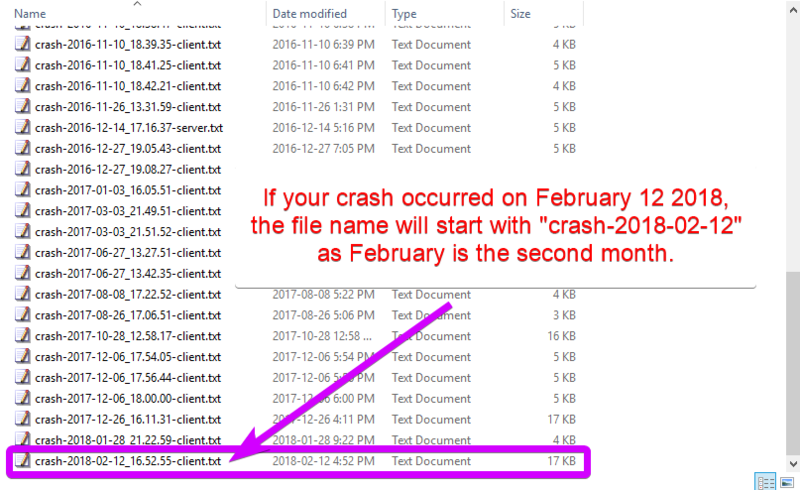 Find the file labelled with the date of your crash. The files follow the pattern “crash-YYYY-MM-DD”. If a crash report with the correct date can not be found, go to “Locating a Log File”. If a crash report can not be found or a log file is request, navigate to the “.minecraft” folder. Find the file labelled with the date of your crash. the files follow the pattern “YYYY-MM-DD”. If you have not run Minecraft since the issue occurred, the file will be named “latest.log”. There will always be a log file available. Ensure your file is a “.txt” or “.log” file. If you are sending a log, make sure you are sending the actual text file and not the .log.gz archive. Navigate to the Podcrash+ Bot’s private messages. Drag the file into the Bot’s private message channel.